Definition: Typhus is a disease caused by infection with one or more rickettsial bacteria. It is also known as typhus fever. Common symptoms include fever, headache, and a rash. Typically these begin one to two weeks after exposure. Typhus is caused by different species of Rickettsia bacteria that are transmitted to humans by lice, fleas, mites, or ticks. The insects have carried person to person or are brought to people by rodents, cattle, and other animals. There is currently no commercially available vaccine. Prevention is by reducing exposure to the organisms that spread the disease. Treatment is with the antibiotic doxycycline. 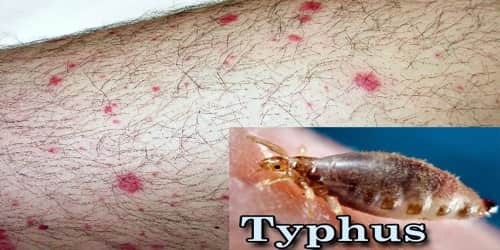 The type of typhus people are infected with depends on what bit them. Arthropods are typically carriers of a typhus strain unique to their species. Typhus has been described since at least 1528 AD. The name comes from the Greek typhus (τύφος) meaning hazy, describing the state of mind of those infected. While “typhoid” means “typhus-like”, typhus and typhoid fever are distinct diseases caused by different types of bacteria. 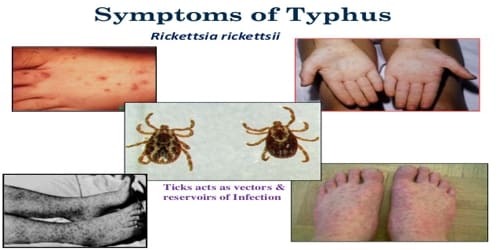 Causes, Sign, and Symptom of Typhus: The causes of typhus are small Gram-negative coccobacilli-shaped bacteria, members of the genus Rickettsia that are intracellular parasites of many animals and utilize the components within the cell to survive and multiply. 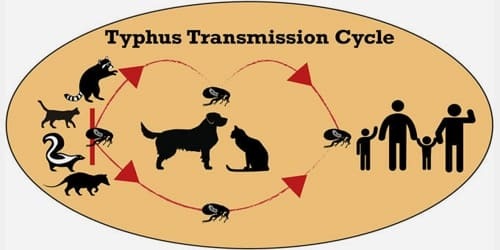 Typhus is sometimes generally labeled as flea-borne, tick-borne typhus, or louse-borne typhus, depending on the vector that transmits the bacteria. Occasionally, the bacteria may become dormant in infected cells, and years later, again begin to multiply (causing Brill-Zinsser disease). The two Rickettsia species responsible for the two main types of typhus are Rickettsia prowazekii, the cause of epidemic typhus, and R. typhi, the cause of endemic typhus. Scrub typhus is usually classed as a separate disease entity. Tick-borne typhus is also classed as a separate disease called spotted fever. Patients may develop additional symptoms of bleeding into the skin (petechiae), delirium, stupor, hypotension, and shock, which can be life-threatening. Diagnosis and Treatment of Typhus: Medical professionals base their diagnosis on the patient’s clinical history, physical exam, and tests based on an identification of the bacterial genus and species by PCR testing of a skin biopsy from skin rash or lesions, or blood samples. 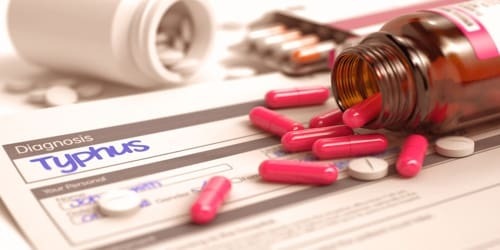 Typhus can also be diagnosed, usually late or after the disease has been treated with antibiotics when significant titers of anti-rickettsial antibodies are detected by immunological techniques. Antibiotics are used to treat the infection. People are usually started before they get their test result, as this can take up to a week. Most people start to feel better within 48 hours of starting treatment. It’s important to keep taking their antibiotics until they’re finished, even if they feel better. People with severe typhus may need to be treated in hospital.